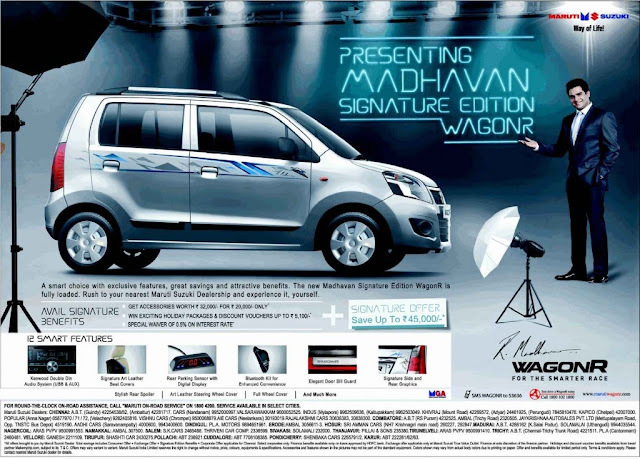 Maruti Suzuki has introduced a WagonR Limited edition called - Signature Edition. However there was no official statement from the Japanese carmaker nor a mention on their website, but a sudden display in today's newspaper is what clicked us ! WagonR's brand ambassador Madhavan has endorsed this special edition and hence his signature as a part of their body graphics on the side and rear of the car. Other new features include a Kenwood 2-DIN audio system with USB and AUX support, rear parking sensors with a digital display, a Bluetooth kit and art leather covered seats and steering wheel. The cost of the total features listed above comes to INR 32,000 however as a introductory package, Maruti offers all this at just Rs 20,000 thereby you save Rs 12,000. Moreover additional discount of Rs 5,100 is also mentioned on this one. In case you would like to go for finance scheme, gain another 0.5% discount in interest rates.